I can’t tell you when I bought my Champion Skull hat. I remember getting it tagged for the first time at Oasby BE and I remember which horse I was riding that day. I also remember that I sold that horse in 2009. We’re talking a hat that was a minimum of 5 years old, and more likely 6 or 7. 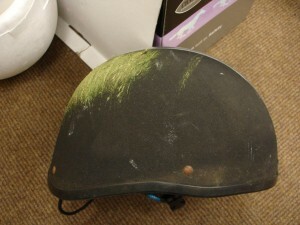 But I’d never had a fall in which I thought I’d hit my head so had never got round to replacing it. They’re blooming expensive things and so long as I assumed that the hat was still safe, there was always something higher on the list of necessary purchases. Until one day last month when I had a silly fall team-chasing (annoyingly between the final fence and the finish line – only I could manage that one!). I maintain to this day that I didn’t hit my head but unfortunately the evidence says otherwise and this time there was no alternative. The hat had to go! Champion saw the picture I posted on Facebook and got in touch to ask if they could have the hat for testing. The results were rather scary! The hat is a ventair deluxe produced at Champions Cardiff factory in June 2007 batch 13 to PAS 015 1998. 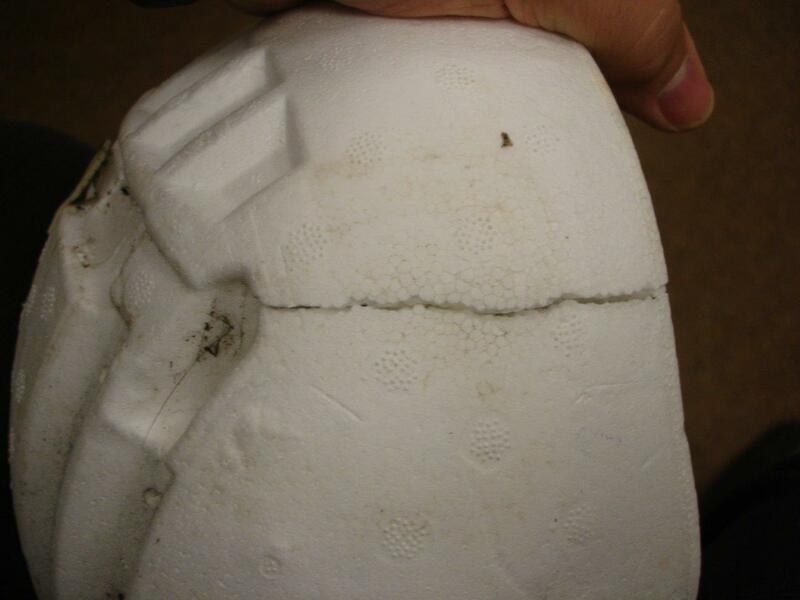 The damage is not easily seen and is difficult to show on a photograph, the shock absorbing polystyrene liner has a split/crack at the front right temple area and some impact damage, crushing of the liner at the rear crown and rear bottom edge. So it’s good that she’s got a new hat!! And she should have got a new one quite a time ago! So, kids, it’s time to be grown-ups. Barring the grass-stains my hat looked perfect from the outside. And I honestly and truly did not think that I had hit my head. But the evidence says that not only did I hit my head with some force on that occasion, but I had also done the same thing several times over the life of the hat. Lesson learned! I have replaced my hat with an up-to-date model of the same Champion Ventair Deluxe Skull (after all, I’d say it’s done me a fair service over the years) and will now be preaching to people to change their hats regularly. Not quite as regularly as your underwear maybe, but after every fall, however insignificant you feel it may have been at the time. Should it happen that your superglue is better than mine and you don’t hit the deck at the drop of a hat (sorry guys, couldn’t resist it) then you should probably replace it every couple of years regardless. 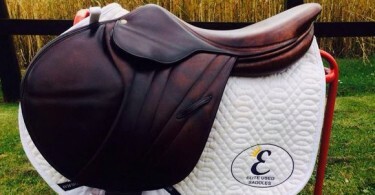 Sure, it’s expensive, but so are horses. And, hey, it’s only your life you might save! Ha! Am fanatical about replacing mine and always get told off by husband for being overly cautious, extravagant and spending unec. cash. Largely on the basis that there is nothing in my head worth protecting, which is, unfortunately, pretty true. Feel vindicated by this. Can anyone send their old hat to Champion for testing? I have the same make/model and just bought a new one (after 5years) to be on ‘the safe side’ but expect I may have been 3 years too late doing so too! Would be interesting to see. I have no idea I’m afraid Ellie, but you could ring or drop them an email – they may well be interested. You only have one head. Why would you not protect it? If you don’t want to wear a helmet, I guess you’ll make a nice organ donor. I was bronked off last year, i landed on my chest and of course that’s where the pain was. I was unaware i’d hit my head until i got home and couldn’t focus, i had concussion and my hat had saved a worse injury to my head. Replaced the hat of course. Several years ago a new school horse bucked me into the rafters. I hit my head on the saddle on my way down. I was dazed for a few minutes but managed to sway to my feet. I even got back on for a few minutes. I denied injury. 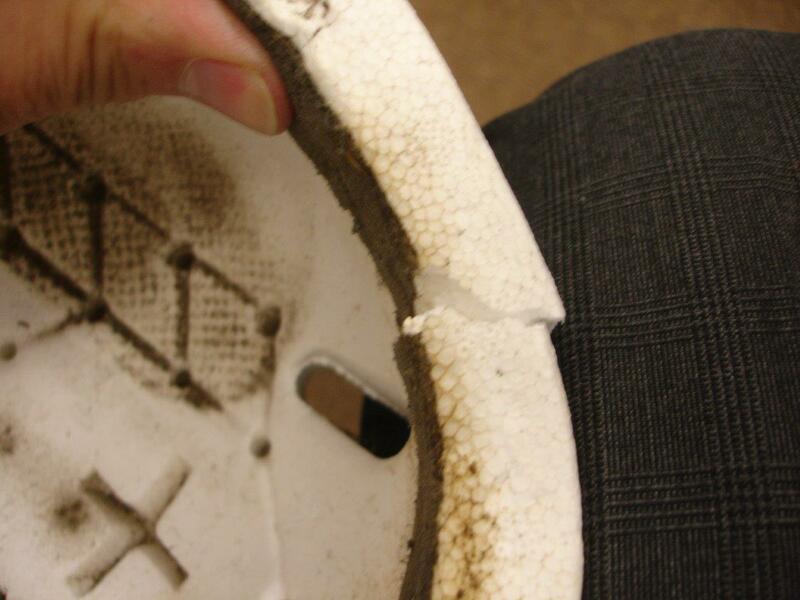 My Charles Owen helmet was only a month old. The tack shop shipped it to them and I completed an on-line report. Diagnosis: the helmet cracked. 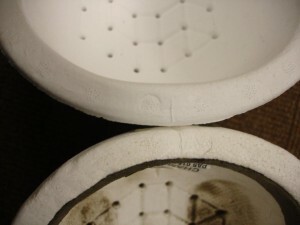 They pro-rated the wear and I replaced it at a discounted cost. I did have a concussion. 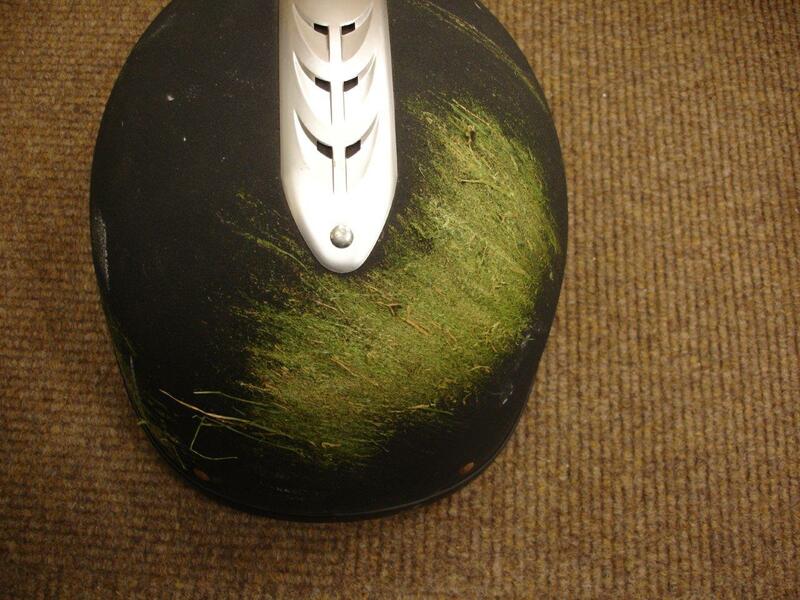 I now replace my helmet every 3 years. A few months ago I had a minor tumble when a horse fell. I replaced the helmet. I’m glad I did because 2 weeks later my new horse spooked as I was mounting. I went into the wall head first. Unconscious for 30 minutes. The paramedics removed my helmet. Although the exterior looked fine except for a scuff mark,the polystyrene liner was cracked and crushed. 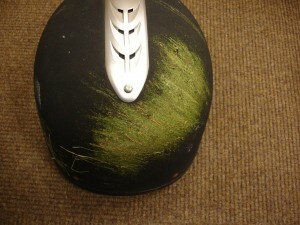 It was an relatively inexpensive schooling helmet but it probably saved me from a fracture. Thanks for this little report, it was the big nudge I needed to go out and get my daughter a new hat today. 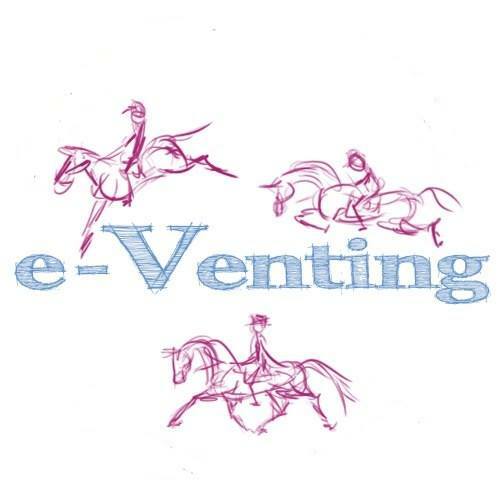 She’s had her Champion Ventair for at least 4 years and it’s experienced a few minor falls and probably a couple of drops on the tack room floor. Sounds awful now I’ve typed it, but when you can’t see any visible damage to the outside of the hat, and falls weren’t really classed as bad ones, I found, like many, you get up, dust yourself off, and thank the person watching over you that the hat worked and kept you safe once again. Reading your post made me realise how silly we have been. With my daughter’s horse having a few issues recently resulting in a couple of throws, my nerves regarding her hat had peaked. I think I’ll be pulling her old one apart to see how it’s faired now she’s got a lovely new one to wear.